A student from Buckingham can look forward to a golfing trip to Portugal after winning the nett category of a national golfing competition. Ana Pearson, 12, who plays at Buckingham Golf Club, took the nett title in The Daily Telegraph Vitality Junior Golf competition. She will now go on the plane to Quinta do Lago to sample the competition atmosphere and get expert tips on how to improve her game further. Ana’s achievement is all the more extraordinary given she only took up the game two years ago. 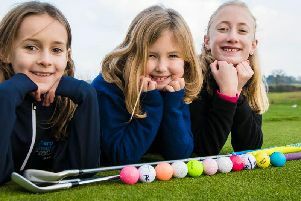 Ana, a student at Akeley Wood School said: “I started playing two years ago and took it up because both my older brothers played and because I live very close to the golf club. Ana who has a handicap of 19.6, plays after school and at weekends and also has lessons on Saturdays. Ana plays regularly at county level for Buckinghamshire and hopes to be either a golf profesional or coach when she is older. She cites Charley Hull, a female professional golfer who has won on both the Ladies European Tour and LPGA Tour as her inspiration. Ana’s mum Emma said of her success: “We are really surprised how quickly she has taken to it. The Telegraph Junior Golf competition is an annual event with a reputation for acting as a breeding ground for big-name golfers. Justin Rose, Matt Fitzpatrick and Melissa Reid are among the previous winners of the competition.